Projections for enrollment in the new insurance options created under the Affordable Care Act (ACA) are often point-in-time estimates. But just as people frequently move in and out of being uninsured, insurance coverage through Covered California (California’s health insurance marketplace) or through Medi-Cal is dynamic and can change for an individual over the course of a year. This churn in enrollment is important to understand and predict. In order to maximize the number of insured Californians, Covered California will need to reach individuals who become eligible for coverage between open enrollment periods. Understanding the extent and nature of churn can help in planning for ongoing enrollment, ensuring smooth health coverage transitions and continuity of care, and reducing uninsurance. The California Simulation of Insurance Markets (CalSIM) model version 1.7 provides a demographic profile of the California non-elderly population with household income at or below 138 percent of the Federal Poverty Level (FPL) projected to be enrolled in Medi-Cal in 2019,1 and the non-elderly population with household income between 139 and 400 percent of FPL projected to be enrolled with subsidies through Covered California in 2019. This analysis uses the longitudinal Survey of Income and Program Participation (SIPP) and calibrates the population in the 2004-05 and 2008-09 panels to match the demographics of the two groups predicted by CalSIM. Following each cohort across 12 months and observing changes in income, take up of employer sponsored insurance (ESI), and loss of insurance recorded in the SIPP, the analysis predicts the share of those originally enrolled who will remain in the same type of coverage at the end of the 12 months. The odds of becoming uninsured are adjusted to account for policy changes under the ACA.2 In this analysis, we assume that the chance of Covered California enrollees becoming uninsured is reduced by 90 percent (from chance of becoming uninsured without the ACA) under a stronger retention scenario and 50 percent under a weaker retention scenario. 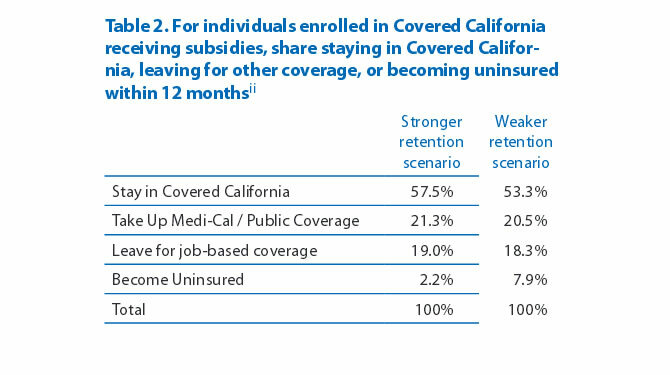 We further assume that no Medi-Cal enrollees who continue to be eligible will drop their coverage to become uninsured. Table 1 shows how many of those initially eligible for and enrolled in Medi-Cal will remain eligible over the course of the year, how many will become eligible for coverage with subsidies through Covered California, and how many will leave for employer-sponsored insurance (ESI). These estimates assume that Medi-Cal enrollees become eligible for Covered California only if their incomes fall within 139-400 percent FPL for two consecutive months and final annual income exceeds 138 percent FPL. As mentioned above, they also assume “perfect re-enrollment” where no one eligible for benefits leaves Medi-Cal to become uninsured. This assumption is unlikely to hold in reality; despite the fact that Medi-Cal does not require premium payments, there will no doubt be people who remain eligible but for various reasons will not be re-enrolled. This analysis does not estimate the extent of those re-enrollment challenges and can therefore be considered a best-case scenario for churn in Medi-Cal. Table 2 shows how many of those initially eligible for and enrolled with subsidies through Covered California will take up Medi-Cal or other public coverage over the course of the year, how many will leave for ESI, and how many become uninsured. These estimates are calculated using two scenarios: stronger retention and weaker retention (see methodology for more details). The results under both scenarios are similar and do not appear to be very sensitive to these retention assumptions. For a given cohort of enrollees in Medi-Cal with household income at or below 138 percent FPL, about three-quarters (74.5 percent) are expected to remain enrolled in Medi-Cal after 12 months, while one in six (16.5 percent) are expected to experience income increases that will make them eligible for Covered California. Because Medi-Cal is such a significant program in California, the percentage who become eligible for Covered California amounts to a relatively large number of individuals. Administrative redetermination hurdles were a significant source of churn in Medi-Cal before the ACA.iii Because redetermination will happen every 12 months instead of every 6 months and will be more automated under the ACA, we should expect a somewhat more stable Medi-Cal population. National SIPP analysis from 2001 suggests that prior to the ACA, 55 percent of a cohort of Medicaid enrollees were enrolled for the entire year,iv a smaller share than we predict in California in 2019 under the ACA. California administrative data indicate that churn prior to the ACA varied by eligibility category. Of the approximately 1.4 million Californians enrolled in Medi-Cal as CalWORKS recipients, 77 percent were continuously enrolled for a year or more; 52 percent of the low-income families not enrolled in CalWORKs remained for at least a year.v Administrative data also reveal that a significant share of Medi-Cal enrollees–6 percent of those ever enrolled throughout the year–currently experience a gap in coverage of less than a year.4 This short-term loss of coverage is more likely to be the result of an administrative glitch than a true change in eligibility, and is thus a good target for increasing coverage stability in the population. Effective implementation of the changes aimed at streamlining the redetermination processes is required for the stability of the Medi-Cal population to actually increase. For a given cohort of enrollees with subsidies in Covered California, a little over half (53.3 to 57.5 percent) are expected to remain in that coverage for the entire year. This is roughly similar to the share remaining in the nongroup market nationally without the ACA. According to Kaiser Family Foundation analysis of the national SIPP in 2010-2011, of those who had only nongroup coverage in January 2010, 56 percent still had only nongroup coverage in December of 2010.vi Prior to the ACA, purchasers on the nongroup market could be rejected for pre-existing conditions and did not have a centralized online marketplace to compare plans. The ACA provides subsidies to some consumers to increase plan affordability, and mandates that individuals have health insurance coverage for at least nine months of the year or face a tax penalty. All these changes should encourage enrollment both among those who expect to be in the marketplace for long periods of time as well as people who expect to have a different form of coverage within 12 months. Enrollment in Medi-Cal and Covered California will be dynamic as Californians move in and out of coverage and change coverage sources. This policy brief predicts a significant level of churn out of Medi-Cal and Covered California each year. Approximately one-fifth of the cohort of Covered California enrollees are expected to transition to public coverage such as Medi-Cal, and another fifth are expected to transition to employer-sponsored coverage. At the same time, Californians will be newly enrolling in Medi-Cal during the year. Many individuals will enroll in Covered California during special enrollment periods,vii as they experience certain triggering events which make them eligible for enrollment outside of the regular enrollment periods. Triggering events are often but not always changes in life circumstances including losing job-based coverage, getting married or having a child, or moving into a new service area.viii Consequently, it will be vital for the enrollment infrastructure–from outreach, to the website, to in-person and call-center assistance–to be available and active even outside of open enrollment periods. Changes in eligibility do not guarantee enrollment. The risk of becoming uninsured during the kinds of life transitions that precipitate such changes in eligibility are well documented. Job loss or change, divorce or widowhood, aging out, disability, and moving are all associated with loss of insurance.ixMaking sure that people successfully transition from one type of insurance to another will depend not only on the ease of enrollment, but also the extent to which Covered California and Medi-Cal take advantage of existing institutional points of connection to people undergoing these life transitions, e.g., COBRA notices or government services like unemployment, CalFresh (food stamps), or the Department of Motor Vehicles. Bouts of uninsurance are known to have negative health consequences. The uninsured have higher mortality overall,x and are more likely to go without care.xi Those who are not continuously insured underutilize preventive care, and have been found to use more care when they do become insured.xii It will be important that outreach, enrollment assistance, and effective sign up processes are available throughout the year for Medi-Cal and for those who experience life transitions that qualify them for mid-year enrollment in Covered California. Children in households with income at or below 266 percent of FPL are eligible for Medi-Cal, but only those in households with income at or below 138 percent were included in this analysis. These policy changes include the minimum essential coverage requirement (the individual mandate), the provision of advanced premium tax credits (subsidies) and cost-sharing subsidies to make individual coverage more affordable, and streamlined enrollment and renewal processes. To see why, imagine the following simplified scenario: 100 people are enrolled in Covered California in January, and 57 of those original 100 are still enrolled in January of the following year. Imagine that the population enrolled stays steady at 100 because take up in the population generally is not changing. Imagine further that all short-term enrollees stay for exactly 4 months. Thus, in May 43 people leave and 43 new people join. The same thing happens in September. Looking over the course of the year 100+43+43=186 people were ever enrolled; 57 of them (31 percent) were enrolled for the whole year, and 129 (69 percent) were short-term enrollees. Note that this estimate is not a cohort analysis, but is a share of those ever enrolled over the course of a year. This analysis used only select aid codes in Medi-Cal, meant to approximate those who will be eligible under Modified Adjusted Gross Income (MAGI) rules under the ACA. DHCS Research and Analytical Studies Division, “Continuity in Medi-Cal Eligibility (Churn in Population) Pivot Table.” Fiscal Year 2010-2011. Available online at www.dhcs.ca.gov/ dataandstats/statistics/Pages/RASD_Medi-Cal_Enrollment_Trends. aspx. Analysis performed by Elise Gould, Economic Policy Institute and Dave Graham-Squire, UC Berkeley Labor Center. Benjamin D. Sommers, “Loss of Health Insurance Among Non-elderly Adults in Medicaid.” Journal of General Internal Medicine. Volume 24, Number 1 (2009): p. 1-7. John L. Czajka and James Mabli, “Analysis of Transition Events in Health Insurance Coverage.” August 2009. Mathematica Policy Research, Inc.
California HealthCare Foundation, “Medi-Cal Facts and Figures: A Program Transforms.” May 2013. California Health Care Almanac. Gary Claxton, Larry Levitt, Anthony Damico, and Matthew Rae, “How Many People Have Nongroup Health Insurance?” December 2013. Kaiser Family Foundation. For more on this issue, see Rick Curtis and John Graves, “Open Enrollment Season Marks the Beginning (Not the End) of Exchange Enrollment.” November 26, 2013. Health Affairs Blog. For a partial list of triggering events see: https://www.healthcare.gov/how-can-i-get-coverage-outside-of-open-enrollment/. California state law goes beyond federal regulations to include additional triggering events that make individuals eligible for a special enrollment period in Covered California or the individual market. California Insurance Code 10965.3 (d) and Health and Safety Code 1399.849(d). Ken Jacobs, Laurel Lucia, Ann O’Leary, and Ann Marie Marciarille, “Maximizing Health Care Enrollment through Seamless Coverage for Families in Transition: Current Trends and Policy Implications.” March 2011. University of California, Berkeley Center for Labor Research and Education and Center for Health, Economic and Family Security. Andrew P. Wilper, S. Woolhandler, K.E. Lasser, D. McCormick, D.H. Bor, and D.U. Himmelstein, “Health Insurance and Mortality in U.S. Adults,” American Journal of Public Health, Volume 99, Number 12 (2009): p. 2289-2295. Michelle M. Doty, S.D. Rustgi, C. Schoen, and S.R. Collins, “Maintaining Health Insurance During a Recession: Likely COBRA Eligibility,” The Commonwealth Fund Issue Brief, January 2009. Joseph Sudano and David Baker, “Intermittent Lack of Health Insurance Coverage and Use of Preventive Services,” American Journal of Public Health, Volume 93, Number 1 (2003): p. 130-137; and J. Michael McWilliams, E. Meara, A.M. Zaslavsky, and J.Z. Ayanian, “Use of Health Services by Previously Uninsured Medicare Beneficiaries,” The New England Journal of Medicine, Volume 357 (2007): p. 143-53. We thank Laurel Lucia and Zachary Goldman for their helpful comments and Jenifer MacGillvary for her help in preparing this brief. Why would a person sign up for Obamacare but not pay the premium?